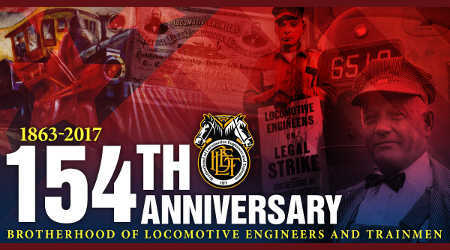 The Brotherhood of Locomotive Engineers and Trainmen (BLET) yesterday marked its 154th anniversary. The union was founded as the Brotherhood of the Footboard on May 8, 1863, in Marshall, Mich. A year later, the union changed its name to the Brotherhood of Locomotive Engineers — the name it held for more than a century before it merged with the International Brotherhood of Teamsters in 2004 and became the BLET. The BLET is the oldest labor union in the Western Hemisphere, union officials said in a press release. The union also was the first labor organization to obtain contracts with railroads, according to the BLET. Among the earliest contracts was an agreement with the former New York Central in 1875. Today, the union has hundreds of contracts with large and small railroads.